If you are visiting businesses in Chicago, you might see more and more converting their lighting to LED, installing smart thermostats like Ecobee and Nest, upgrading their HVAC equipment to the most energy efficient units on the market, or just plain doing great things. Often, those businesses are a Verde Company. This means, not only do they care about the environment and make sustainable choices, but that they make smart business decisions. They do things for the long term, and they are likely to be a business that you can attend for years to come. You may see this window cling on their front door - designating a Verde Certified Company. If you don't notice this in their window, but care about the future of this company (and maybe the planet too), then let them know to connect with Verde. We want your help in reaching every business in Chicagoland, so we can spread the word and make sure these businesses are primed to make it in the competitive business environment. In case you notice a slight change in our name - we used to be referred to as Verde Sustainable Solutions. 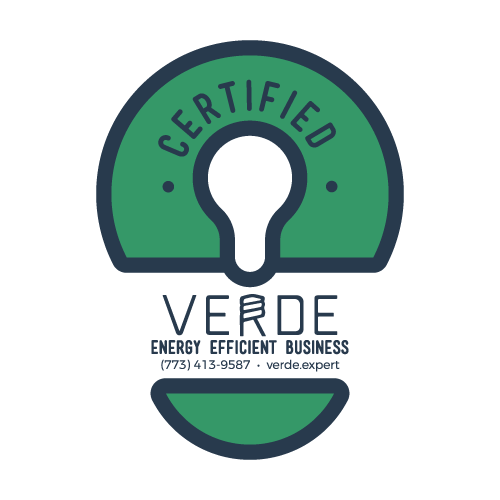 However, during a recent branding exercise in The Verde Manifesto, we have found that Verde Energy Efficiency Experts is a better description of how we help customers reduce energy exclusively. Sure we provide our customers with cool reusable bags, reusable waters bottles, as well as LED flashlights - but those are just part of our swag. We are singularly focused on not just recommended changes, but making them for our Chicagoland partners. Connect them with Verde Energy Efficiency Experts and we will make sure they are spending less money on energy, so they can spend more on their great service or product. Companies that spend less on energy are more likely to be around in the future.